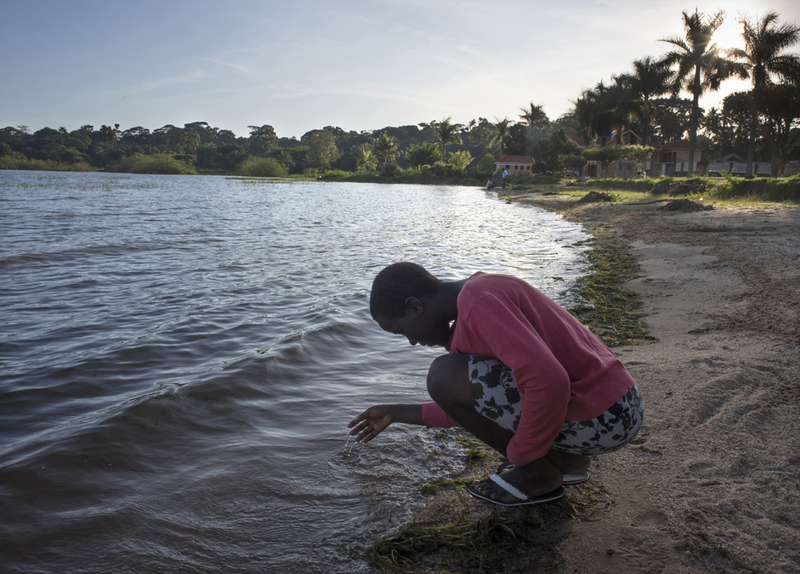 Rial’s photos capture visions of hope: Jalia, a girl from the Bright Kids Uganda orphanage, contemplates the waters on an outing to Lake Victoria. She lost both parents to AIDS and her goal is to be a surgeon. Twenty years ago, Pittsburgh photographer Martha Rial traveled to central Africa for a grim job: portraying the lives of refugees from the brutal ethnic wars in Rwanda and Burundi. Published in the Post-Gazette, her pictures won the Pulitzer Prize for Spot News Photography, and one picture became iconic. It showed a seemingly endless line of men, women, and children lugging their bundled-up belongings past the camera on a winding rural road, the column stretching sinuously back into the distance and out of view—all of them headed somewhere, anywhere other than the places they once called home. The Pittsburgh Cultural Trust’s 937 Liberty Gallery is now mounting an exhibit of new African photos by Rial. Taken recently in Uganda, a country that likewise has suffered hard times, these pictures tell an encouraging story. They focus on orphaned and disadvantaged children who are being housed and educated to build a better future. The show, running from Sept. 23 to Nov. 13, is aptly titled In Uganda: A School to Call Home. An open community forum on Sept. 29 (reception at 6 p.m., speakers at 7 p.m.) features guests including key people behind the work in Uganda. And given that there’s quite a backstory to this exhibit, here are some basics. Like many post-colonial nations, Uganda—free of British rule since 1962—has struggled. The notoriously cruel dictatorship of Idi Amin during the 1970s was followed by further troubles, including armed rebellion in the north and a countrywide AIDS epidemic. Though strides have been made in quelling these twin woes, they’ve decimated the ranks of healthy adults while combining with other problems to hobble the society. Uganda remains one of the world’s poorest countries … and with a median age of about 15, it may be the youngest. The legions of young people are the country’s best hope but also a major concern. Many live in fractured families scraping to get by; many orphans live in the streets. Here in Pittsburgh, Rial was drawn to the issue when she met a Ugandan tackling the problem. The photographer has maintained a strong interest in Africa, visiting several countries since the trip that led to the Pulitzer, and she keeps contact with units at the University of Pittsburgh that study and work on African affairs. What Rial learned was a tale of how good deeds can have a multiplier effect. The speaker, Victoria Nalongo Namusisi, had worked as a journalist and then a public-sector official amid periods of extreme turbulence in Uganda. Moved by the numbers of children severely affected, she opened the Bright Kids home in 2000 near the town of Entebbe, to shelter and nurture some of the region’s neediest. And one she took in was a boy named Medi Bugembe. At the Great Kings and Queens Children’s Centre, children who don’t have homes to return to over the winter school break rely on each other for support. This newer venture of Bugembe’s is both a home and a school. Located on the outskirts of Kampala, the capital city, it serves a large pool of need. When Rial visited with her camera she found that “Medi had convinced about 50 street children to live there” and hundreds of youngsters, in total, were studying at the school he’d organized. The education component is crucial. Although Uganda has a policy of free public schools for all, there aren’t enough to meet the demand. Kids who get in find classes overcrowded, and their families still have to pay various fees, which many can’t afford—let alone afford private-school tuition. At Great Kings and Queens, Rial explained, nonresident students from very poor homes can attend on a charity basis, while the quality of the school is sufficient that better-off families in the area are paying to send their children. At present the school goes up to grade seven, the capstone of Uganda’s primary system; graduating students take exams aiming for placement in secondary schools elsewhere. Expansion of Bugembe’s school would be nice, but finances are tenuous and donor-reliant as it is. Rial’s photo exhibit may help to spur interest in the project. The pictures at 937 Liberty Gallery are from both the Great Kings and Queens Centre and Bright Kids Uganda. There’s also a multimedia presentation featuring more images and an interview with Medi Bugembe. Victoria Nalongo Namusisi is confirmed to be there in person at the Sept. 29 forum. One last question we asked Rial: does she consider her work of this type to be photojournalism or art photography? The answer, not surprisingly, was that she hopes it can be seen as both. A precedent for such genre-crossing was set here in Pittsburgh during the 1950s, when the legendary photojournalist W. Eugene Smith visited to take thousands of pictures of steelworkers and city scenes. Dramatic prints from that visit are now widely shown in art museums. So one could say that Rial carries on the Smith tradition, with a difference. This photographer is Pittsburgh-based and her African photos bring other people’s lives home to us. 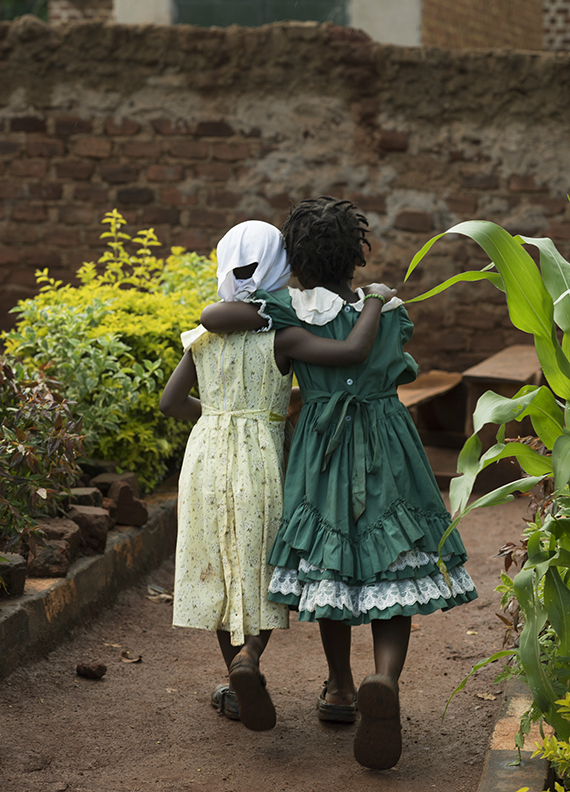 Martha Rial’s In Uganda: A School to Call Home is on display Sept. 23 to Nov. 13 at 937 Liberty Ave., Cultural District. Visit the 937 Liberty Gallery’s web page for times and details. The exhibit is presented by Pittsburgh Cultural Trust with support from multiple sponsors. These include the Ford Institute for Human Security and the Johnson Institute for Responsible Leadership at Pitt’s Graduate School of Public and International Affairs—which has sent student interns to work in Uganda—and the ASA Social Fund for Hidden Peoples. Photos shown here are by Martha Rial, from the exhibit. Rial is an occasional photojournalism contributor to Entertainment Central. For more information about Bright Kids Uganda visit their website. Learn more about the Great Kings and Queens Children’s Centre here. Mike Vargo, a freelance writer and editor, covers visual and performing arts for Entertainment Central.